During Selebrasyon! 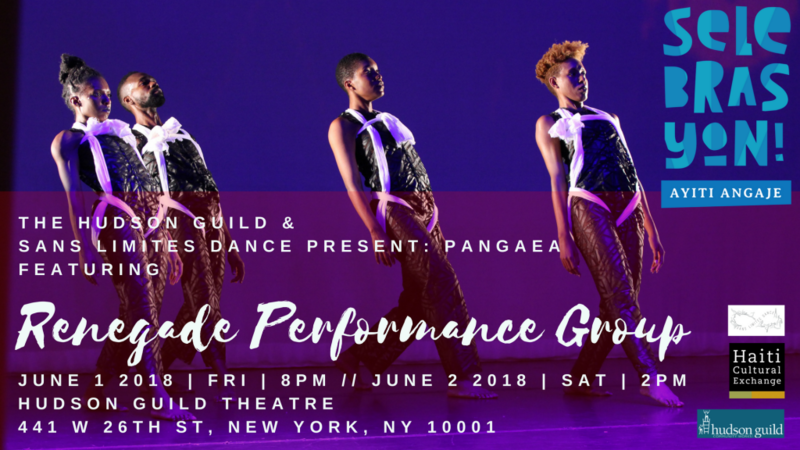 2018, Haiti Cultural Exchange will be participating in the Hudson Guild’s Cultural Kaleidoscope Festival taking place from June 1st to June 20th in the heart of Chelsea. The goal of the festival is to widen the vision for the Guild’s arts programs and locate new and passionate sources of creativity. Through the exchange between new audiences and performers of a wide variety of cultural expressions, the festival will celebrate the rich and diverse heritages of the many individuals and families who are part of the Hudson Guild community. Through a collaboration with Sans Limites Dance, HCX will present six dance concerts that feature choreographic works exploring themes of immigration and diasporic experiences. 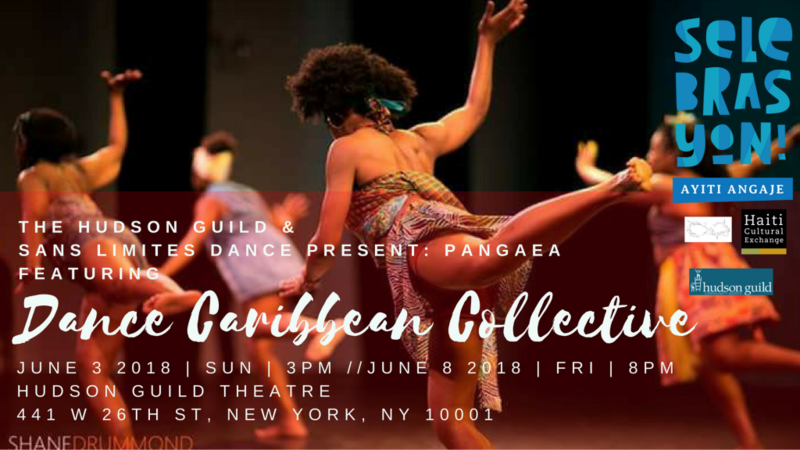 Each of these performances will feature one choreographer of Haitian descent, along with additional companies representing cultures from around the globe. 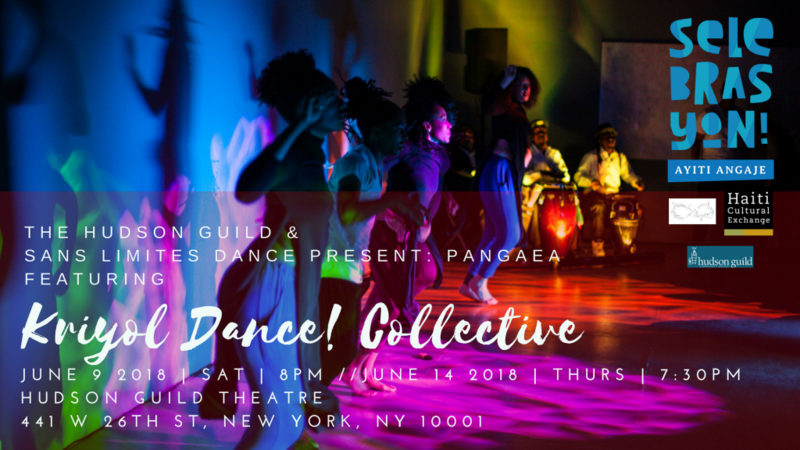 Featured groups include Dance Caribbean Collective, Kriyol Dance! Collective, and Renegade Performance Group. 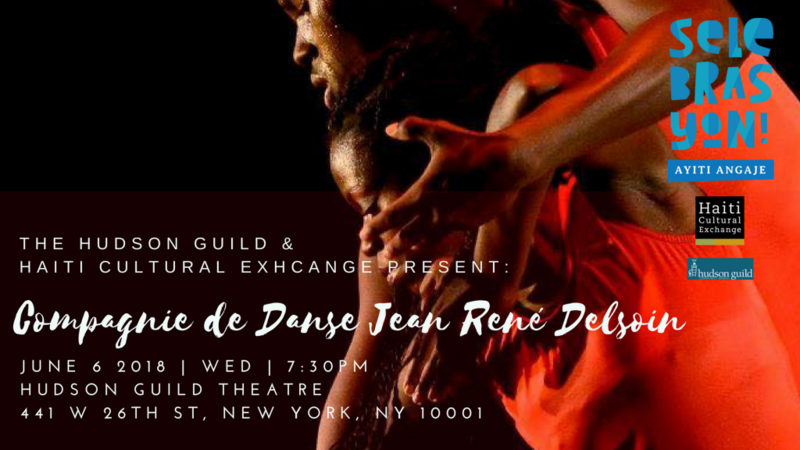 A seventh dance performance will be an evening-length work by Compagnie de Danse Jean-René Delsoin, a Haiti-based dance group that brings the richness of cultural expression and dances in Haiti to the world. HCX is also partnering with the Caribbean Film Academy to present five film screenings that present diverse narratives and unique cinematic perspectives from Haiti and additional Caribbean nations. HCX will facilitate discussions around themes and topics explored at each screening and provide opportunities for audience members to share their points of view. 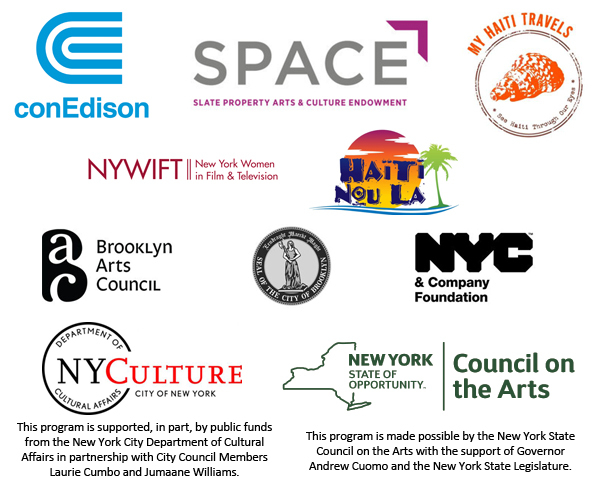 The Hudson Guild is providing the theater-space at no cost and will be supplementing this work with outreach efforts within the local community. To find our more visit haiticulturalx.org/selebrasyon or visit our Facebook events here. Haiti Film Fest 2017 Recap! Through over 25 shorts, documentaries and narrative features in just four days, Haiti Film Fest 2017 was an epic cinematic adventure! It was wonderful to see so many members of the HCX community, and new faces as well, at the festival’s screenings, panels and networking receptions. A special thank you the filmmakers as well as our funders, Advisory Committee Members, Opening Night Host Committee and Media partners, panel moderators, and volunteers. This biennial festival would not be possible without your generous support. Take a look below for a full recap of the 2017 festival and click here to view the full film fest schedule. We kicked off the festival on Thursday, May 11th with our Opening Night Fundraiser at the Alamo Drafthouse Cinema. The event was hosted by Midwin Charles, founder of the law firm Midwin Charles & Associates LLC and a Contributor at Essence Magazine. Doors opened at 7PM and as guests entered the venue they posed for our photographers Claire J. Saintil and Liz Gauthier, and were treated to a Haiti Film Fest tote bag, complimentary cocktails, and hors d’oeuvres. The event started off with The Last Haiti: The Moving Portraits by Steven Baboun and a sneak peek of Tezen by Shirley Bruno. Both films are phenomenal representations of Haitian cinema and set the stage for the many screenings that would follow in the days to come. Next, we awarded the honorees of the night: Rachelle Salnave, Jimmy Jean-Louis, and Arnold Antonin. While accepting their awards, Salnave spoke passionately about the importance of creating content that exposes the beauty of Haiti and Antonin expressed the difficulties of creating films in the Haitian context and thanked HCX for its support in the dissemination of Haitian films. Unfortunately, Jean-Louis was unable to be in attendance due to an unforseen contractual obligation, but photographer Marc Baptiste accepted the honor on his behalf, and thanks to technology Jean-Louis was able to share a few words via video chat. During his speech, he emphasized the importance of finding ways to support young Haitian artists and their dreams because he would not be where he is today without the support of others. The event ended with a few words from Paul Beaubrun, a Haitian musician who emphasized the importance of organizations such as HCX whose support of artists allows opportunities such as his touring with Ms. Lauryn Hill. He stated that the local support he received from HCX is what has allowed him to take his musical career to a global level – and encouraged attendees to donate to HCX in order to support organizations artists of Haiti and the Diaspora. Following the event, the afterparty took place at the Alamo’s House of Wax where guests mingled and celebrated the kickoff to Haiti Film Fest 2017 until the wee hours of the morning! Five Myles Gallery was packed for our Friday night Evening of Shorts, a night dedicated to supporting young and emerging filmmakers. The event was filled with enchanting short films that delivered big messages. From the excitement of young love to the pain of family separation – each film showcased universal human themes that were infused with the unique spirit of Haitian culture. The night started off with Christie Koralane Augustin’s Carpe Diem, a lighthearted romantic comedy about a young man named Andre who has a crush on a lovely librarian named Sasha. The film scored many laughs with the audience and stirred up nostalgic feelings of being young and in love. Next, was the art film, The Last Haiti: The Moving Portraits by Steven Baboun, the film showcased beautiful and emotion filled “moving portraits” of Haitians and Haiti. Following that were the docu-shorts, Toussaint Louverture: Miroie d’une Societe by Pierre Lucson Bellegarde and Haiti is A Nation of Artists by Jacquil Constant, the first provided the audience with a quick, in-depth glimpse into the world of the famous Haitian leader and the latter exposed the beauty and culture of Haiti through the eyes of artists. After that was, Elegy for Stivenson Magloire by Edouard Eloi & Shalom Gorewitz, this short focused on the paintings and life contours of the Haitian artist, Stivenson Magloire. Up next was Rosario Lacroix’s Valiz La, a lighthearted modern silent short that takes us on fun adventure through the streets of Haiti, as we follow the travels of a magical bag. Trailing that was, Taking Chance by Jerry Lamothe and Haitian Son by Marc-Eddy Loriston, both films explored themes related to the difficulty of living in an urban area and having to make life altering decisions for survival. And then there was the film, Baldwin’s Prophecy by Richard Louissaint, narrated by James Baldwin this short gave the audience a dance interpretation of the mental impressions that happen when interacting with police enforcement. After that, the audience was taken on an emotional rollercoaster with the short, Les Pleureurs by Michelle Marrion; the short focuses on a hired crier who has trouble emoting due to her traumatic past. And rounding out the evening was Minutes to Say Hi by Easmanie Michel and See(ah) by André M. Zachary – Michel’s film showed the point-of-view of a child having to adjust to a new life in Brooklyn after leaving Haiti and Zachary’s film captures the beauty of the Crown Heights and conflicted feelings around so-called progress in the community through the lens of a seer woman. We ended the evening with a networking reception at Franklin Park, where guests were able to network with the creators of the films. 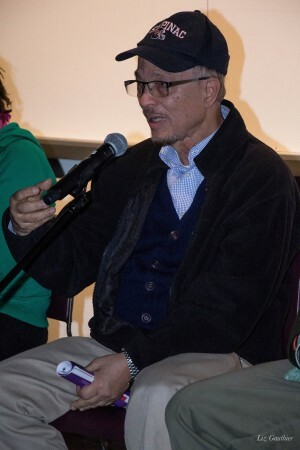 Following that, we had a keynote discussion featuring Arnold Antonin, a prolific Haitian film director, who is known for his social, political and cultural commitment to Haiti. 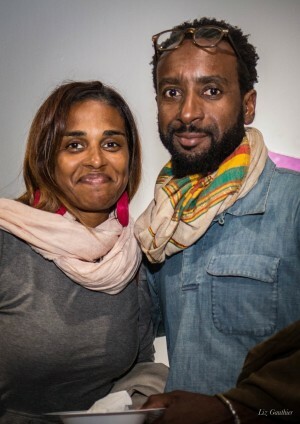 The panel was hosted by digital content creator, Frtiz Archer and also included filmmakers Rachèle Magloire and Jacquil Constant. After the panel discussion held a special tribute to Arnold Anotonin’s films, including Faiseur de Fanaux, Courage de Femme; Benita et Merina, Herby, le Jazz et la Musique Haïtienne and the New York premiere of Rene Depestre On Ne Rate Pas Une Vie Eternelle. Thank you to everyone who came out and showed support – none of this would be possible without you. 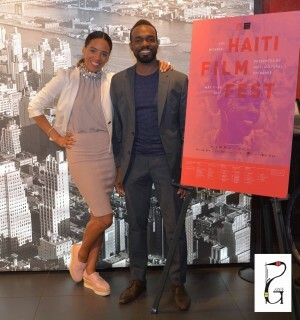 Click here to take a look through the Haiti Film Fest 2017 photos. The 4th Biennial Haiti Film Fest took place May 11-14, 2017. 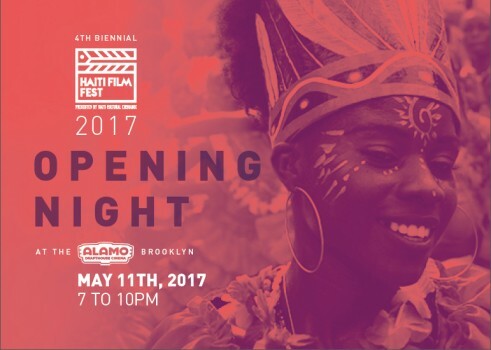 Join Haiti Cultural Exchange (HCX) and Friends for the Haiti Film Fest Opening Night Fundraiser, taking place on Thursday, May 11th at Alamo Drafthouse Cinema in Downtown Brooklyn. This celebratory event is the official launch party for the 4th Biennial installment of Haiti Film Fest. Established in 2011, HCX’s Haiti Film Fest highlights emerging talent in Haitian communities, and features provocative and innovative storytelling via narrative films, documentaries, feature-length projects and short films that depict the diversity, depth and vibrant spirit of contemporary Haitian cinema. 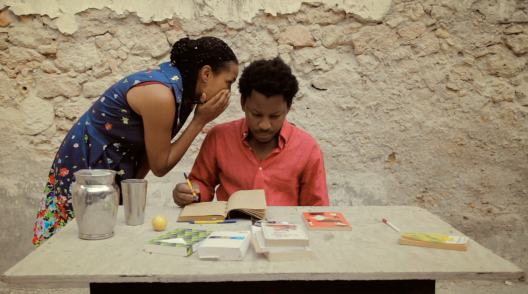 Join us for an exclusive screening of the critically acclaimed film Ayiti Mon Amour. 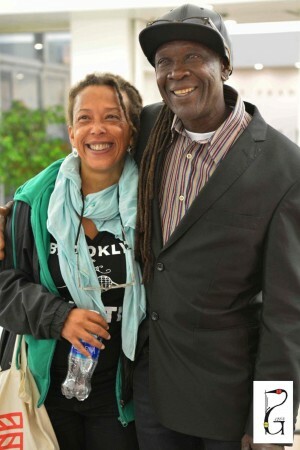 Presented in collaboration with the Caribbean Film Academy (CaFA), the Brooklyn Cinema Collective, and BAM Cinematek. In a small fishing hamlet forgotten by the rest of the world, the sea is gaining ground and although the memories of the great disaster still lingers, life and love must prosper and survive in the aftermath of the 2010 earthquake in Haiti. Several characters try to make sense of their own existence, including a teenager studying Japanese who is bullied for being light-skinned, a writer and his muse who are grappling with their identities, an old fisherman caring for his ailing wife. With demonstrations against corruption becoming as commonplace as fisherman fighting for their livelihood, the hopes and fears of the Haitian people collide at a critical moment in their history. Written & Directed by award-winning Haitian-American filmmaker Guetty Felin. Q & A with the Director, Actors, and Special Guests to follow the screening. “AYITI MON AMOUR,” was a Yellow Robin Award nominee at the 2016 Curacao International Film Festival Rotterdam, where it made its World Premiere. Its U.S. Premiere was at the 2016 San Francisco International Film Festival. Click here to learn more about Selebrasyon! 2016.